Board Abraham Martin's bus to discover unforgettable places on the Plains. A historic guided tour tinged with humour for the whole family! Did you know that the Plains of Abraham are among the largest city parks in the world? That two Stanley Cups were won here? Although he is about 400 years old, the venerable Abraham Martin has lost none of his memory. To learn all there is to know about the park, hop on his bus and he will help you discover various aspects of the history of the Plains, which were named after him. 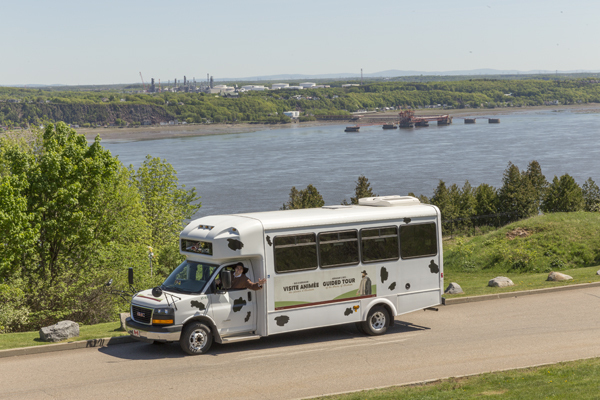 Indeed, the park draws its popular name from Abraham Martin, the King's pilot and a friend of Samuel de Champlain. His cattle used to graze here, including this delightful cow of his which accompanies him on his bus tours. and, of course, the passageway taken by the British and the site of the face-off with the French. But do not fear, our brave Abraham will protect you if you happen to run across the enemy! July 2 to September 2. Several departures daily. Places limited. Reservations and departures from the Plains of Abraham Museum.